H. James Watt Haematologist, oncologist, father, sailor. Born Oct. 24, 1950, in Toronto. Died Sept. 4 in Tuscany, Italy, of cardiac arrest, aged 70. My sister Martha says that my father wanted to be a physician from the age of 4. I once asked him if he had ever wanted to be anything else and he said, No, I like what I’m doing, and besides I’m good at it. And he was right. Dr. H. James Watt grew up on Toronto Island and attended school in a one-room schoolhouse where he accelerated twice. His parents were of Scottish/English ancestry and owned Watt’s Coffee Shop on Centre Island. Little Jimmy, as he was known, grew up peeling potatoes while his mother Dolly baked as many as 30 pies on a summer’s morning. As a teenager, Jim Watt was a member of the Island Canoe Club and began paddling competitively, finally winning the Canadian Championships in 1947. 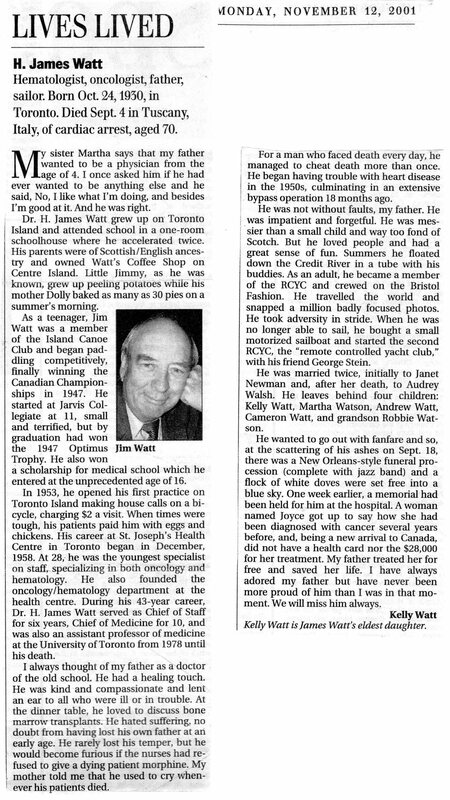 He started at Jarvis Collegiate at 11, small and terrified, but by graduation had won 1 the 1947 Optimus Jim Watt Trophy. He also won a scholarship for medical school which he entered at the unprecedented age of 16. In 1953, he opened his first practice on Toronto Island making house calls on a bicycle, charging $2 a visit. When times were tough, his patients paid him with eggs and chickens. His career at St. Joseph’s Health Centre in Toronto began in December, 1958. At 28, he was the youngest specialist on staff, specializing in both oncology and hematology. He also founded the oncology/hematology department at the health centre. During his 43-year career, Dr. H. James Watt served as Chief of Staff for six years, Chief of Medicine for 10, and was also an assistant professor of medicine at the University of Toronto from 1978 until his death. I always thought of my father as a doctor of the old school. He had a healing touch. He was kind and compassionate and lent an ear to all who were ill or in trouble. At the dinner table, he loved to discuss bone marrow transplants. He hated suffering, no doubt from having lost his own father at an early age. He rarely lost his temper, but he would become furious if the nurses had refused to give a dying patient morphine. My mother told me that he used to cry whenever his patients died. For a man who faced death every day, he managed to cheat death more than once. He began having trouble with heart disease in the 1950s, culminating in an extensive bypass operation 18 months ago. He was not without faults, my father. He was impatient and forgetful. He was messier than a small child and way too fond of Scotch. But he loved people and had a great sense of fun. Summers he floated down the Credit River in a tube with his buddies. As an adult, he became a member of the RCYC and crewed on the Bristol Fashion. He travelled the world and Snapped a million badly focused photos. He took adversity in stride. When he was no longer able to sail, he bought a small motorized sail-boat and started the second RCYC, the “remote controlled yacht club,” with his friend George Stein. He was married twice, initially to Janet Newman and, after her death, to Audrey Walsh. He leaves behind four children: Kelly Watt, Martha Watson, Andrew Watt, Cameron Watt, and grandson Robbie Watson. He wanted to go out with fanfare and so, at the scattering of his ashes on Sept. 18, there was a New Orleans-style funeral procession (complete with jazz band) and a flock of white doves were set free into a blue sky. One week earlier, a memorial had been held for him at the hospital. A woman named Joyce got up to say how she had been diagnosed with cancer several years before, and, being a new arrival to Canada, did not have a health card nor the $28,000 for her treatment. My father treated her for free and saved her life. I have always adored my father but have never been more proud of him than I was in that moment. We will miss him always. Kelly Watt is James Watt’s eldest daughter.